Riyad Mahrez has defended himself from "untrue assumptions" about his period of absence from Leicester that followed a failed move to Manchester City. The winger, 26, has travelled for Saturday's Premier League tie at City, whose rejected deadline day bid sparked a dispute between player and club. On Friday he trained for the first time since handing in a transfer request. In a statement the Leicester Mercury reported, Mahrez said the Foxes had "always been aware" of his whereabouts. He said that "many people claiming to be my friend" had "spoken about me and things they know nothing about". He added: "Off the back of that many people and journalists have made assumptions without properly checking the story, so I would like to clarify that all those so-called assumptions of why I was absent are completely untrue. "I have been a part of the Leicester City team that has achieved much success including promotion to the Premier League and being Champions of the League. "My goals have always been the same and I have always given my full 100% when I play for the club the fans and my team-mates. "Those goals remain the same today and in the future and when I am asked to be a part of the Leicester team, rest assured I will continue to give my all." It is not clear whether Mahrez will be selected to play at City, but if he does feature, it will be his first game since 20 January. Leicester rejected a City bid of around £50m for Mahrez on the closing day of the winter transfer window. Mahrez had made a transfer request the day before, but the Foxes refused to let the 2016 PFA Player of the Year leave as their valuation of him exceeded the fee City were prepared to pay. Foxes boss Claude Puel said on Thursday that he would not pick Mahrez for Saturday's trip to City. Puel accepted his player had faced a "difficult situation" and promised the club would "help him come back with a smile". 'Deserves better' or 'a big baby'? 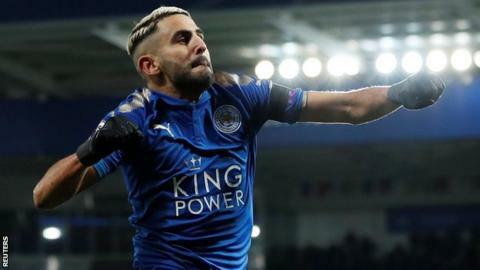 Mahrez's international coach Rabah Madjer said the player "deserves better than Leicester", but former England striker Chris Sutton was critical of the player's reaction to his move collapsing. "He's a big baby isn't he? Leicester has put him on the map," Sutton told BBC Radio 5 live. "If I was one of his team-mates, I'd be deeply unhappy with him." Match of the Day pundit Danny Murphy believes Mahrez will leave the club this summer, saying: "He's outgrown Leicester. He's a Champions League player." Since Mahrez last played, Leicester have beaten Peterborough in the FA Cup but followed that win with a defeat at Everton and a home draw with Swansea in the Premier League. Mahrez has scored eight league goals this season and delivered seven assists, helping his side to eighth place in the Premier League. In total, Mahrez has scored 44 goals in 165 games since joining Leicester for £400,000 from French side Le Havre in January 2014. There's work to be done by both parties to build bridges, but his status as one of the greatest players in the club's history means Mahrez still has some credit in the bank. Puel surely won't put him in the matchday squad, given what message that would send to the rest, but allowing him to travel is a step in the right direction.